I think it’s a fact that some stitches just scream for multi-color! This series gives instructions for stitches like these, includes photos to see what the end result look like, and suggests color sequences to best display the stitch. The Color Sequence as pictured above is 2 colors alternating every two rows. 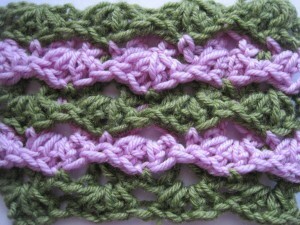 Repeat Rows 4 and 3, then 4 and 5 until desired length is reached, continuing to repeat Color Sequence. Have any questions or comments about this multi-colored stitch? Ask away! This entry was posted on Tuesday, December 28th, 2010 at 12:00 AM by Erin Burger	and is filed under Tutorials and Help. You can follow any responses to this entry through the RSS 2.0 feed. You can leave a response, or trackback from your own site. Rachel~ that looks so pretty! I’m going to have to try it. What do I do with the yarn strands from the previous color? Do I somehow carry them up the sides. Can you please elaborate on how to do that, if that’s the case? You don’t say to cut, thank heavens! (I think you have a little bitty typo here: “Rows 4-5L Color A, continuing until finished”. I looked at my keyboard and saw that you hit the “L” key in shift mode instead of the colon: Was scratching my head about what “Rows 4-5L . . .” were! Unfortunately I do say to Break off the colors at the end of Row 1, Row 3 etc… Sorry! I hate weaving in the ends but while I was working on these instructions I couldn’t figure out a good way to carry the yarn. Thanks for the heads up on the typo! I’ll fix it right away. That looks really nice. Im trying to crochet a baby blanket but can’t really find a stitch for a boy, what do you recomend? I guess I read thru the pattern too fast and missed the “break off yarn” part! This is OT—but I noticed that there is a silhouette that represents me and my comment. Is there a place here where I can add a photo? I looked but must have missed it! I did a series over the last few months that started here: http://www.crochetspot.com/three-special-stitches-for-your-crocheting-arsenal/ and has several more parts (you can search special stitches on the homepage’s search). 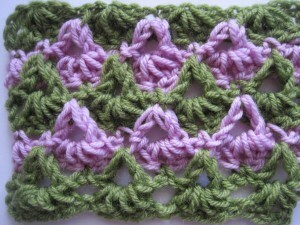 The moss stitch in the first section is the one I use for a lot of boy or unisex baby blankets. It’s also great for sewing applique onto. These were very easy instructions for me as I’ve crocheted many years. However, I’m not an “experienced” crocheter and still have a lot to learn. One of them is: how DO you carry yarns from one place to another? I’ve always avoided patterns with multiple colors because of this. I just do the “break-off-color” bit patterns. Could you do instructions for this sometime? I’m in no hurry now as my New Year resolution is to FINISH what I’ve started. Rachel, this is my favorite site on the internet. Your work is so beautiful, helpful, instructive and generally great to read. I hope you can keep it up!! There are some patterns where you can either pick the yarn back up at a spot usually designated in the pattern, or carry it from one row up to the next up the side of the work. This usually either doesn’t show up on the work, or if it does it can be easily hid by adding a trim up and down the side of the work where the work is carried. Thanks for your interest and comments! I do not like to cut the yarn on multi color projects, either. So, I cut the yarn off long and make the FRINGE on the side where I cut the yarn, OR I do as another person suggested and carry it LOOSELY down the edge and then cover it up with a really nice edging. How do you go about adding/attaching the new yarn so that it doesn’t end up being 1) one big bulky mess and 2) secure so that it doesn’t just unravel? It seems that whenever I do, I end up making a knot of sort, and pulling through the end of the yarn (kinda like this- make a single crochet and pull through the end through the loop, so that it makes a knot). I’m a beginner crocheter, and hope to learn more as time goes on! Crocheting has been in my family for several generations- my grandmother, mother, and aunts all crochet! Thanks for having this site, and thanks for the help in advance! You can read the post http://www.crochetspot.com/perfecting-your-craft-finishing-the-project/ for tips and info about finishing up ends. You have the right idea though.